Features six progressive color-coded handgrips to provide controlled stretch for improved flexibility and ROM. As flexibility improves, increase stretch by moving to the next handgrip position. Unit is completely portable and can be used anywhere. Replaces a stretching partner. Frequent Exerciser. Recent Back Surgery. I had spinal fusion (TLIF) last spring and this helps facilitate deeper stretches. I use the band wrapped around the leg of a chair and pull against it primarily for forward floor stretches and yoga Pigeon pose. The handles and product itself are very sturdy and well-made. 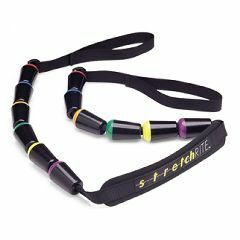 I also use the TheraBand, which has some stretch or give to it (this band does not), for hamstring stretches (pulling my leg to my chest, out to the side and across my opposite leg) while lying on the floor. I definitely get further in my stretches/yoga poses when using these bands without needing assistance from another person. Reasonably priced. Highly recommend. Multifunctional. Targets Muscles. Compact. Sturdy. Easy To Use. I got this to do PNF stretching, and it has been fantastic. Despite the fact that I'm 6'5", 275#, and can deadlift 420, it holds up to the abuse that I give it. The only bad thing I see is that if you use it for a quad stretch behind the head, or to stretch out your shoulder (from top down or from bottom up behind the back) it doesn't give the same ability. This could have been corrected simply by putting another catch just above the grabs. (not to manufacturer) But it is still so useful and functional. I can't say enough about it.